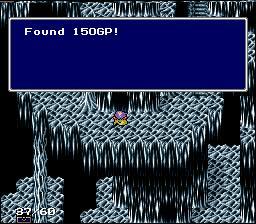 Everyone thinks they know the answer to this one: two versions of this game were released in Japan, known as FFIV Hardtype and FFIV Easytype. 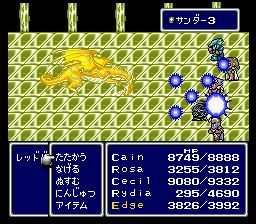 FFIV Easytype obviously had a lower difficulty level, as well as a number of items and character abilities removed. 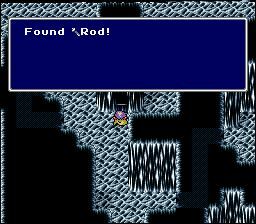 Then, when Square decided to port FFIV to North America, they decided we were too stupid for the regular FFIV and sent us a version of FFIV Easytype that was not only poorly translated but also censored (and misnumbered "FF2") as well. Heck, after being adjusted for point 1 below, that's the story I've told several times myself. There are two major problems with it though. The Silver/Mithril Sword became the Piglet Sword, meaning it was no longered considered metal. (Take that, Dark Elf!) To make things even more surreal, it occasionally turns enemies into pigs. The hit rate for bows was increased. The Heroine Robe no longer has penalties to Wisdom and Will. The Tricker's "weakness" has been changed to Fire instead of lightning. Casting non-Fire spells on the Tricker causes him to respond with a Piggy spell instead of slaughtering your party. It gets better. Has Rydia suddenly gained l33t h341|\|g p0\/\/3Rz? How Much HP Does Zeromus Have, Anyway? Actually, as a practical matter, it's hard to say. 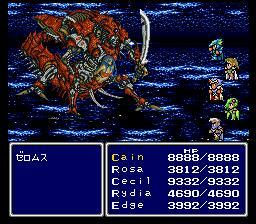 In FFIV, Zeromus does indeed have 65,498 HP, but the catch is that he gets one complete HP refresh during the battle. No one is quite sure yet what exactly triggers it, but you can be pretty sure that getting his HP low probably has something to do with it. (There is no visible indication of when this refresh takes place.) 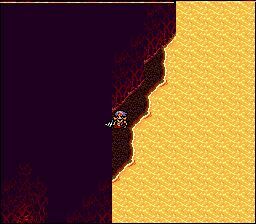 Therefore you can expect to do anywhere from around 100,000 to (at the very most) 130,995 points of damage before you bring Zeromus down. Apparently the figure is slightly lower in FF2 US (and likely FF4 Easytype as well), but the same basic idea applies. Wait a minute, everyone knows how to get a Zeus Gauntlet, right? Like Nintendo Power and the official Final Fantasy Chronicles Strategy Guide (not to mention almost every FAQ at GameFAQs) claim, they are dropped by Skeletons, Red Bones, and/or Skulls, right? Nope, nope, and nope. 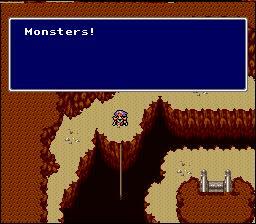 In fact, the aforementioned monsters simply don't drop any items at all. Period. This one's easy: there is no Imp Sword. Imp Captains don't drop anything, much less an Imp Sword. D'oh! OK, everyone pretty much knows this is false, but I add it here for completeness. No, after beating Cagnazzo, there is no way for you to remove Palom and Porom's petrification. You can try to feed them various items with the item menu that comes up when you talk to their statues, but it will be for nothing. There never was any sidequest to unstone them, in any version of FFIV. Or any other Square title except for Super Mario RPG. Why do people incessantly keep asking this? 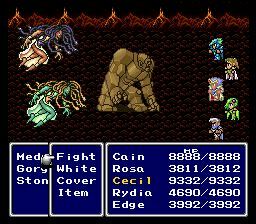 I point out that I have never played SMRPG, but apparently the battle with Culex in that game borrows some battle music from FF4. 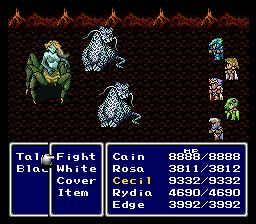 Also, some strategy guide (again, I point out I have no firsthand knowledge of this) supposedly states as fact that Culex is indeed from FF4. Note that the TrapRose can be found pretty much anywhere in the Underworld. You'd expect that these ultra rare monsters would drop cool stuff... and you'd be wrong. 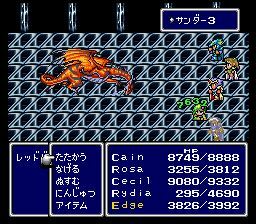 In FF2 US and FF4 Easytype, they just drop crappy healing items. 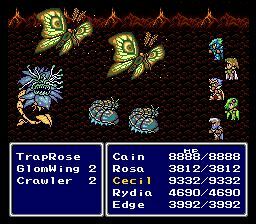 In FF4, they drop... well, mostly just a wider array of crappy healing items. The Gloom Wings however drop Artemis Arrows as an ultra-rare drop, but big deal... you can just steal them from Karys. icb42 has since pointed out that I missed the Gorgon and the Tarantula (or "Talantla" for you FF2 US players...) They can be found in the same three square strip in the top right picture. Gorgons, like Medusa, can drop the Medusa Sword. Thanks to Hiryuu for pointing out where exactly they could be found outside of the usual three-square strip. Thanks to DDCecil for the four of the screenshots, Leroux1 for the location of the Rod, The Materia Keeper for the 6 Ghost battle, and JCE3000GT for informing me of the existance of another Lunar Subterrane item. Alex Jackson - For setting the record straight on FFIV Easytype vs FF2 US. Blair - For pointing out that the back row penalty indeed does exist... under certain circumstances. DDCecil - For the "Invisible Treasure" screen shots. Hiryuu - For pointing out that the rare monsters can be found outside the three-square strip. icb42 - Pointed out I was missing the Gorgon and Talantla in the "Gloom Wing" section. Leroux1 - Pointed out the secret Rod in the Lunar Subterrane. Master Zed - For the Zeromus HP info.